For some perspective on the earnings environment, this chart illustrates "as reported" S&P 500 earnings growth (ie 12-month rate of change) since 1940. For some perspective on the all-important earnings environment, today’s chart illustrates ‘as reported’ S&P 500 earnings growth (i.e. 12-month rate of change) since 1940. There are a couple of points of interest. For one, earnings growth has tended to peak in the 20 to 40% range and trough somewhere in the -10 to -20% range. At least that was the case up until this millennium. Since the dot-com crash (i.e. the 2001 – 2002 timeframe), earnings growth volatility has increased dramatically. In fact, the post-financial crisis spike to 793% is not even shown on today’s chart so as to allow the rest of the data to remain visible (i.e. not flattened out). 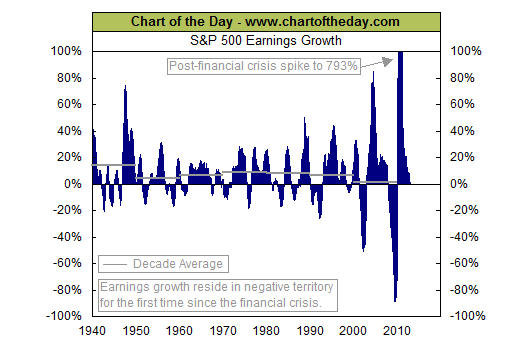 It is worth noting that this historic post-financial crisis earnings growth spike is due in large part to the fact that earnings came in so low as a result of the financial crisis. That said, earnings growth has dipped into negative territory for the first time since the financial crisis. Wilson Electronics, North America's leading maker of cellular signal boosters, yesterday announced a new marine initiative with the development of a signal booster kit that improves cellular coverage for boaters on inland waterways and for near-shore mariners.